President Donald Trump, right, speaks during a meeting with Japanese Prime Minister Shinzo Abe at the G20 Summit, July 8, 2017, in Hamburg, Germany. U.S. President Donald Trump has begun an urgent round of diplomatic consultations with Japan and South Korea about North Korea's intercontinental ballistic missile tests. Trump spoke by telephone with Japanese Prime Minister Shinzo Abe for nearly an hour Monday morning, Tokyo time. A White House statement said the Trump and Abe agreed that North Korea "poses a grave and growing direct threat" to the U.S., Japan, South Korea and other countries, and that the two also committed to increasing diplomatic and economic pressure. In this photo provided by S. Korea Defense Ministry, South Korea's Hyunmoo II Missile system fire missiles during the combined military exercise between the U.S. and South Korea at an undisclosed location in South Korea, July 29, 2017. Abe told reporters he and the U.S. president totally agreed "that we must take further action." President Trump also was trying to reach South Korean President Moon Jae-in, who has been vacationing, U.S. officials said. Abe said Japan and the United States will promote concrete action to enhance defense systems and to ensure their people are safe against the threat from North Korea. Senior U.S. officials said Sunday the time for talking about the diplomatic consequences of North Korea's latest missile test is over, since the danger to international peace that Pyongyang poses is now clear to all nations. At the United Nations, U.S. Ambassador Nikki Haley said the United States is not even asking for an emergency meeting of the Security Council, as it has on previous occasions, because the Western powers are “done talking” about North Korea. China, as North Korea's principal ally and supporter, must now decide if it will act more directly to rein in Pyongyang, Haley added. Pence was in Estonia, one of the United States' NATO allies, when he was asked about the North Korea situation. “The era of strategic patience is over,” the vice president said, and he added pressure will continue until North Korea “permanently abandons” its nuclear and ballistic missile program. 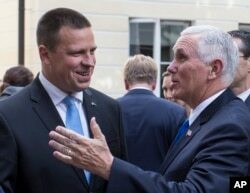 U.S. Vice President Mike Pence, right, and Estonia's Prime Minister Juri Ratas speak prior to their meeting at the Stenbocki house in Tallinn, Estonia, Sunday, July 30, 2017. Pence arrived in Tallinn for a two day visit where he will meet Baltic States leaders. Pyongyang's statements came hours after two U.S. Air Force B-1B bombers flew over the Korean Peninsula accompanied by South Korean and Japanese jet fighters. Separately, the U.S. Missile Defense Agency said it had conducted its 15th successful shoot-down of a medium-range ballistic missile in another test of its Terminal High Altitude Area Defense system, known as THAAD. The target ballistic missile was launched from a fighter jet over the Pacific Ocean, but the military said it was detected, tracked and intercepted by the defense system located in Alaska. The test disclosed Sunday was the agency's 15th consecutive success. 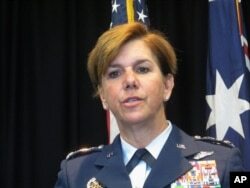 FILE - General Lori Robinson, commander of the North American Aerospace Defense Command and the U.S. Northern Command, USNORTHCOM. Haley said China is aware it must take action against North Korea, and Japan and South Korea are expected to increase pressure on Pyongyang, too. The U.S. ambassador to the U.N. wrote on Twitter that this is not only a U.S. problem, but one that will require an international solution. In a formal statement released by the U.S. mission to the United Nations, Haley addressed the question of calling for Security Council action. In this photo released by Japan Air Self Defense Force, U.S. Air Force B-1B bombers, top, fly with a Japan Air Self Defense Force F-2 fighter jet over Japan's southern island of Kyushu, just south of the Korean Peninsula, during a Japan-U.S. joint exercise. The U.S. Pacific Command said the supersonic B-1 bombers' flight over the Korean Peninsula was a “direct response” to North Korea's missile launch on Friday, as well as its first launch earlier in July of a ballistic missile capable of intercontinental flight. The 10-hour joint forces mission began at Andersen Air Force Base in Guam. 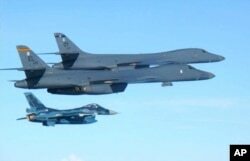 The U.S. aircraft were escorted by two Japanese F-2 fighter jets in Japanese airspace, and four South Korean fighters flew alongside the American bomber crews as they passed over the Korean Peninsula. The B-1s also did a low-altitude pass over South Korea's Osan air base before returning to Guam. At the U.S. Missile Defense Agency, Lieutenant General Sam Greaves said data collected from the successful shoot-down exercise would improve American forces' "ability to stay ahead of the evolving threat" from North Korea. President Trump has focused on China in his comments about the North Korean missile test. “I am very disappointed in China,” Trump wrote. “Our foolish past leaders have allowed them to make hundreds of billions of dollars a year in trade, yet they do NOTHING for us with North Korea, just talk. We will no longer allow this to continue." Pence said Sunday in Estonia that U.S. officials "believe China should do more" about the North Korean crisis. "We believe China has a unique relationship with the regime in North Korea and has a unique ability to influence decisions by that regime, and we call on China to use that influence, along with other nations in the region, to encourage North Korea to join the family of nations, to embrace a nuclear-free Korean peninsula and abandon its provocative actions and its ballistic missile program,” he said. 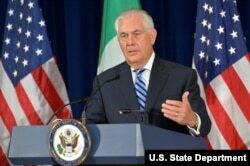 U.S. Secretary of State Rex Tillerson released a statement that blamed both China and Russia for North Korea's continued violations of U.N. Security Council resolutions. “As the principal economic enablers of North Korea's nuclear weapon and ballistic missile development program, China and Russia bear unique and special responsibility for this growing threat to regional and global stability,” Tillerson said. In April, Trump praised his first meeting with China's President Xi Jinping, later telling reporters that Xi had agreed to suspend coal and fuel shipments to pressure North Korea to stop its belligerent behavior. However, since then, the North has continued to threaten its neighbors and the United States, and Trump has grown more critical of Beijing.